For the Conservation and Restoration of your Artworks. See our contact details at the top of the page. 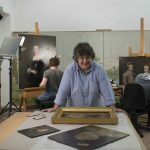 Kiffy Stainer-Hutchins & Co provide a leading service in the practical conservation, restoration and technical study of easel and monumental paintings from the 14th century to the present day. Primarily operating from a 2,500ft² (232m²), purpose converted studio space on the Houghton Estate, near Kings Lynn, Norfolk. This modern, fully equipped facility and dedicated work area is capable of taking on a wide variety of projects concurrently. Due to the spacious nature of the facilities we are also able to accommodate very large and/or numerous paintings at any one time. Our maximum ceiling height and internal and external door access is 4.5m (14ft 9ins). We also have insurance approved fire and security protection system for the protection of the works. Kiffy Stainer-Hutchins has a very wide and diverse range of clients in the UK including significant private collections, independent owners, major and minor public and private galleries and museums, government bodies, commercial galleries, insurance companies, legal bodies, the National Trust, English Heritage and the Church of England. We also have a large body of international clients from USA, Canada, Japan, China, Russia, Mexico, Australia, South Africa, Switzerland, Germany, Denmark, France and Italy.